“If a tree falls in the forest, and there is no one around to hear it, does it still make a sound?” So goes a classic exercise in logic. Any possible answer to this question is reliant upon our interpretation of the term sound, isn’t it? Is it a disembodied physical phenomenon? Is it human experience? Can we escape the dichotomy? 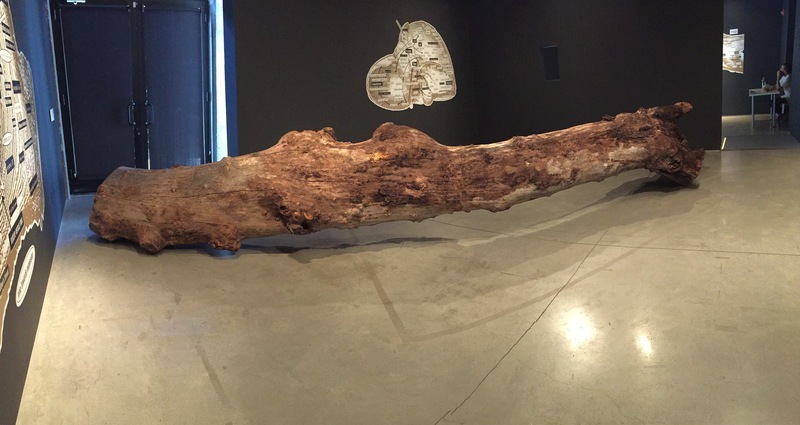 The Fallen Tree is also the title of a recent exhibition by artist Erick Beltrán (b. 1974, Mexico) at the Kadist Foundation in San Francisco. 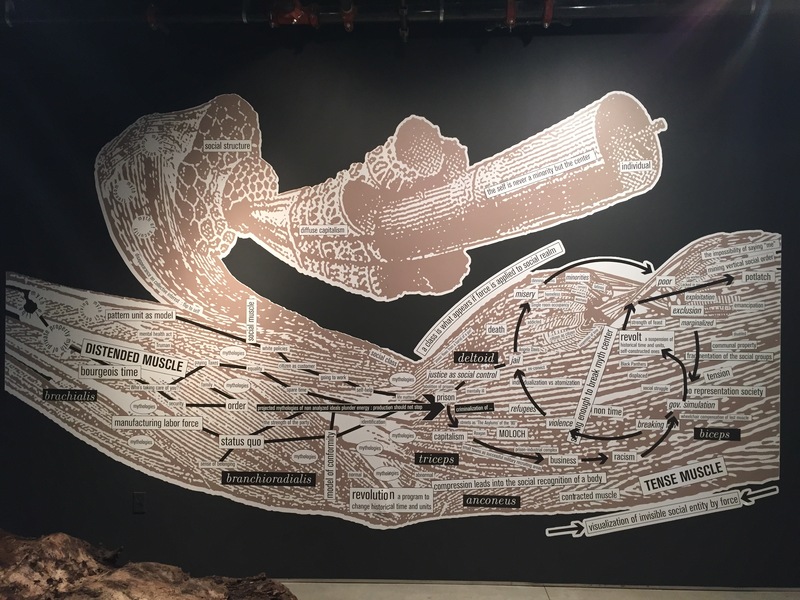 In this exhibition, Beltrán continues his trademark exhibitionary grammar, tailored to Northern California, deploying diagrams and the language of informational graphics. 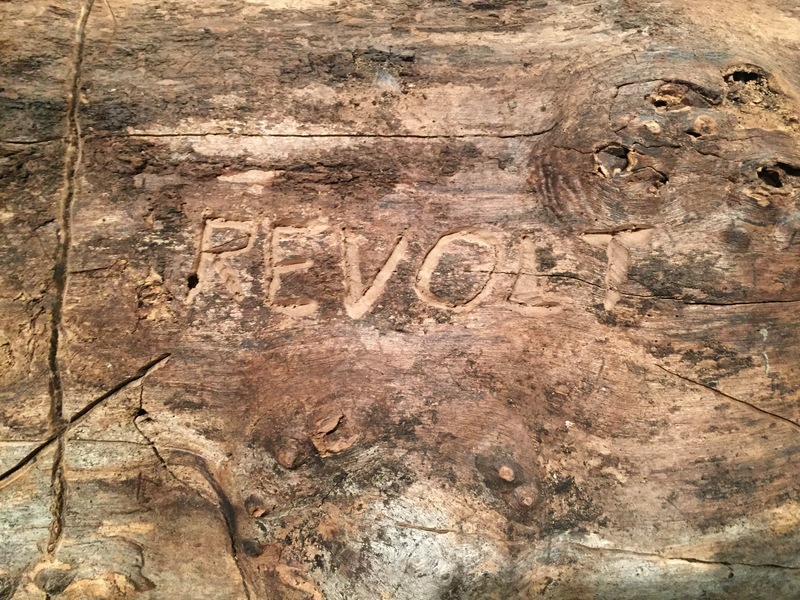 The exhibition contains archival material, and multimedia, to reflect upon the conceptual features of political and economic systems of belief —of ideology. The exhibition comprises a series of large-scale monochrome graphics spread across the walls of two galleries. 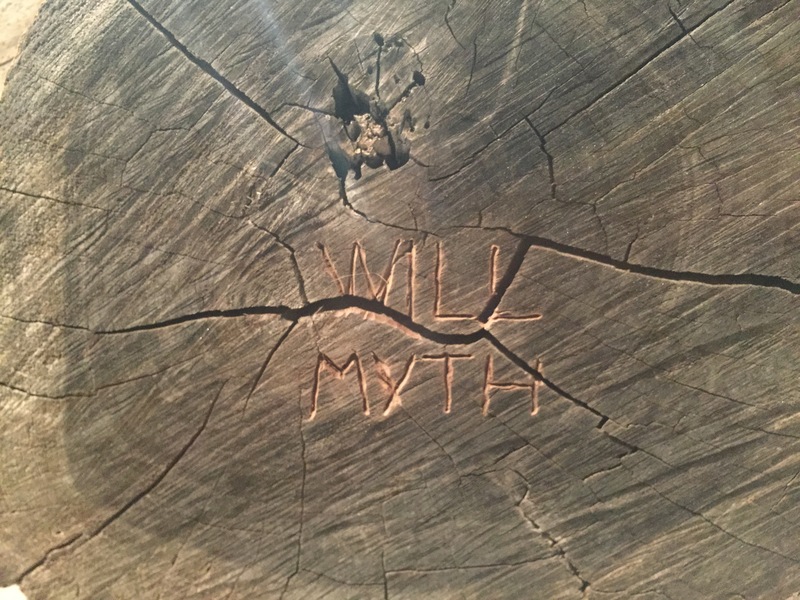 It also includes a sculpture made from a recovered tree-trunk, harvested by a local agency that enables a wiser use of the wood from trees cleared for urban development in the Bay Area. 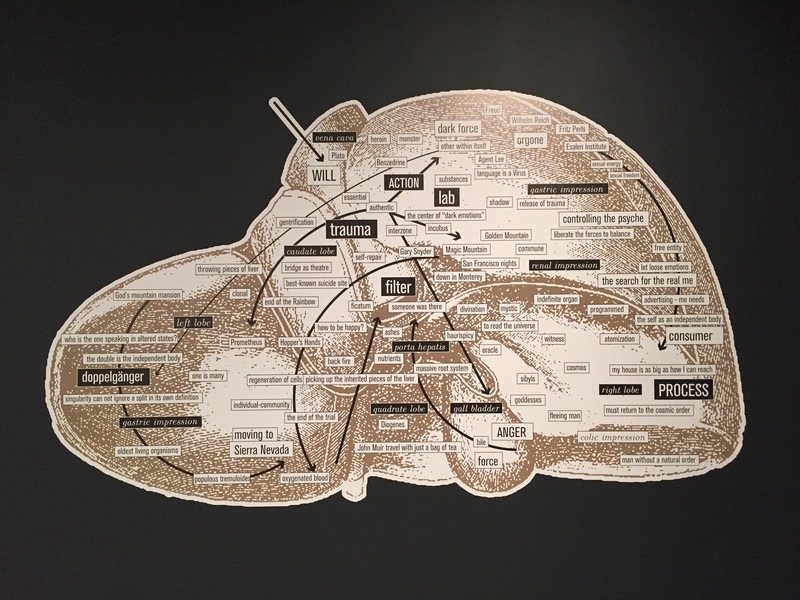 The diagrams present a series of concept webs, offering relations among historical and natural events, dates, names of tissues and organs, geographical locations, and emotions. Lines and arrows, leading to correspondence, and an understanding of the schism between human history and the landscape upon which it unfolds, connect these. These diagrams are charged but not overloaded —they are involved but also compelling. One of the diagrams describes two Western systems of thought; one favoring a concentration of power and wealth, and another favoring imperialistic aspirations or expansion. 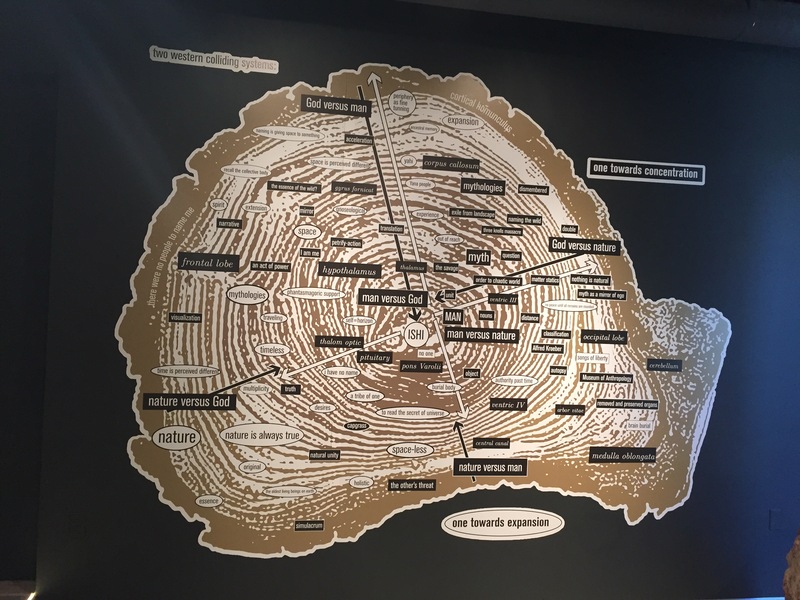 Beltrán printed the diagram over an illustration of a cross-section of the trunk of a tree, with all its concentric, irregular rings in detail. This fusion enables a synthesis between what is pictured in the background and the relationship of the concepts above it. 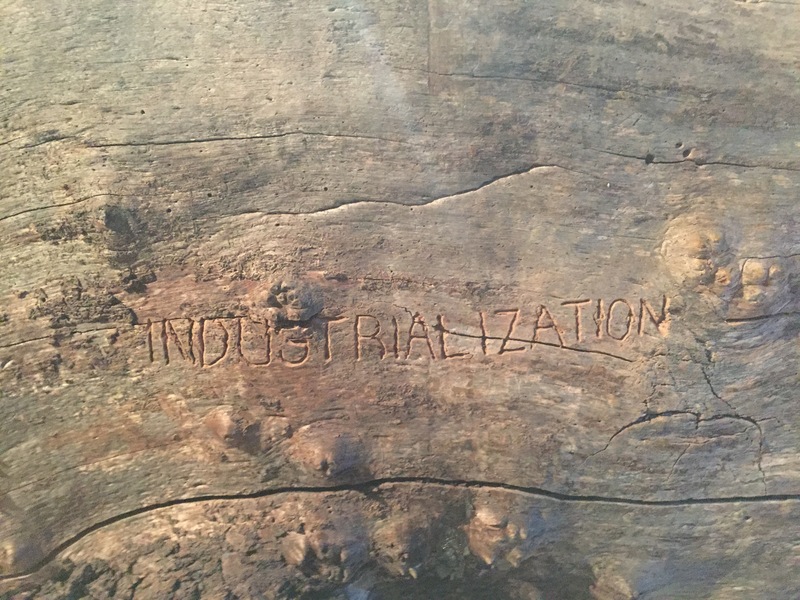 The tree-trunk bears inscriptions with many of the terms that appear in the diagrams etched in its contours and textures. These words and phrases telescope the human condition, the history of colonialism, and the very core of dominant Western ontologies. 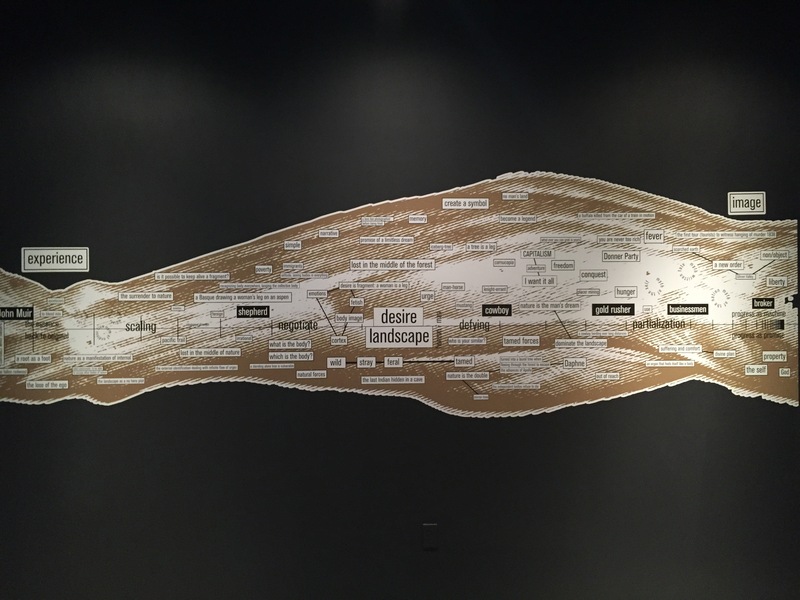 The tree lies on its side as if fallen at the center of one of the galleries, and as you circle it you can see some of the words inscribed on the tree appear calling you from the diagrams on the wall. The tree, a victim of human activity, is presented as both witness and casualty. In The Fallen Tree, Beltrán places geological and biological forces in contraposition with human historical progression. The exhibition speaks of the unavailability to the industrialized nations of the world of a syntonic relationship between the human project and the rest of life systems of the earth. Beltrán’s diagrams explicitly illustrate the tendency in Western capitalist societies of distinguishing themselves from —and unduly taking advantage of— the matrix of life. Additionally, they address the historical forces and motives behind human global expansion, not just in radical pursuits of knowledge and prosperity, but also necropolitics and unbridled exploitation of the environment —all visible features in the landscape of human history. Beltrán exposes some myths behind the pursuit of a relationship with our environment (or Nature, or Gaia). “It either has meaning, and humans must try and understand it with the goal of becoming one with it, or it has no meaning, and humans can use it as a thing,” he explains. Certainly there are many other ways to interface with nature, even between the two points in this (additional) polarity —human sentience is misleading. We humans show the tendency to reason in terms of dualities, perhaps this is because our brains are divided into two halves. Still, today science and art, capable of many more taxonomic distinctions than ever, upset the dualities of old, enabling newer, more capacious structures of thinking, and new ontological turns. 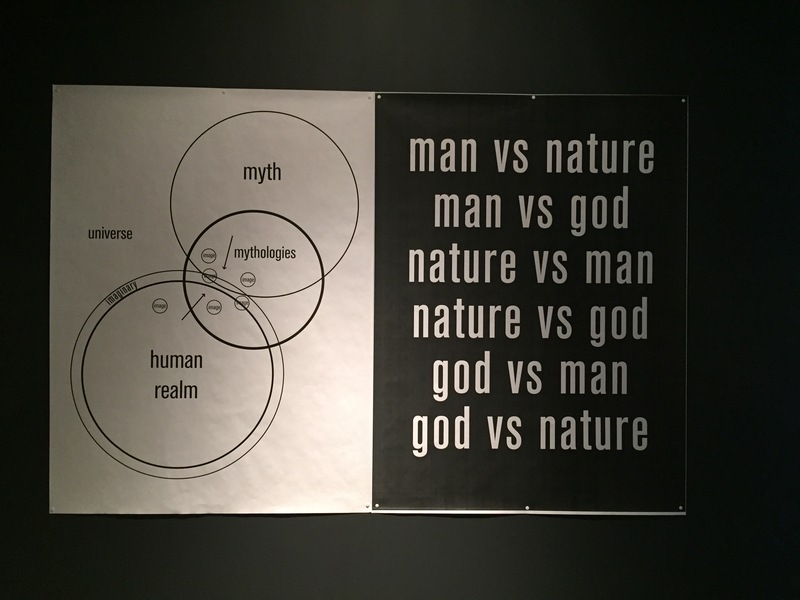 By showing us these eco-ideological diagrams Beltrán gets us to think about the mindsets that pervade the Californian ecological self-concept/perception. Casting historical characters and their myths—from Ishi, the “last wild Indian,” to the naturalist John Muir— in a critical and aesthetic light.